The recent Webinar ‘What is Responsible Management Learning and Education’, presented by Oliver Laasch, attracted 163 registered participants from 17 countries. Out of these, 86 attended (53%). The lively discussion led to 34 questions covering, among others, conceptual considerations, hands-on advice on materials, and pedagogy, as well as course design. The event was produced by Prof. Regina Bento, sponsored by the Management Education and Development (MED) division of the Academy of Management and the University of Baltimore Merrick School of Business. 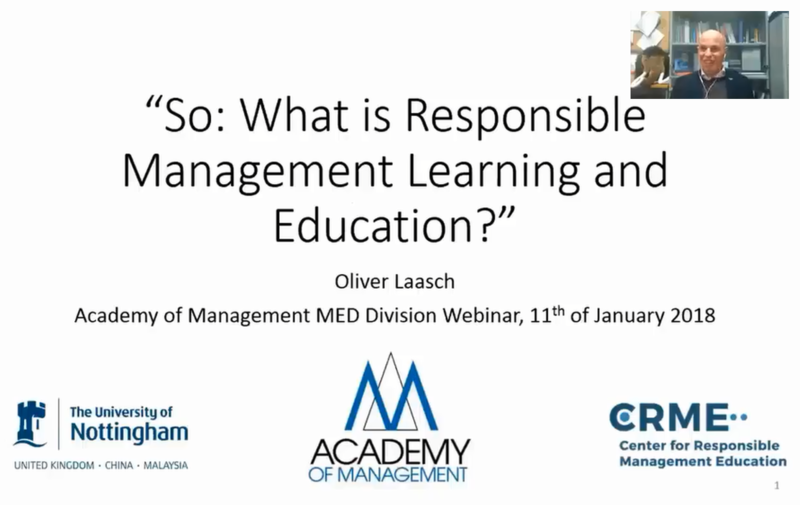 It was the kick off to a regular MED webinar series covering topics of responsible management learning and education for a global audience. More recent webinars, for instance, featured Henry Mintzberg and his work on re-balancing society. For full background information please click here. The presentation slides as pdf can be downloaded here. The full webinar recording including presentation and Q&A is available on YouTube here.